Either saving costs or increasing production, the new generation of energy-efficient pump sets and hose reel systems are allowing growers to choose the best product for their needs, Richard Crowhurst reports. With irrigation costs ranging from £10 to £32 per hectare, it is no wonder that when looking to invest in new equipment, efficiency features are an important consideration for growers. According to farm mechanisation adviser Bill Basford, one area ripe for attention is the amount of electricity, or quantity of diesel, used at the pump. Variable-speed electric pumps can give savings, while for diesel-powered systems it is important to match the pumpset to the amount of energy required, he told a recent open day hosted by Briggs Irrigation. Growers should also be aware of the internal diameter of the hose used on reels, he adds. Long lengths of small diameter hose are unlikely to provide adequate pressure at the rain gun, leading to poor distribution and higher energy requirements. "Refining the system, based on accurate knowledge of the energy costs for each part, can easily reduce total irrigation costs by around 10 per cent. Making changes, such as using booms instead of rain guns, has adoption challenges but these changes may earn more back in higher saleable yields, not just in reduced operating costs. The payback period for some new equipment and for increased automation, such as telephone-based control, can be as short as one year," says Basford. Growers are also seeing irrigation as a way to increase production. 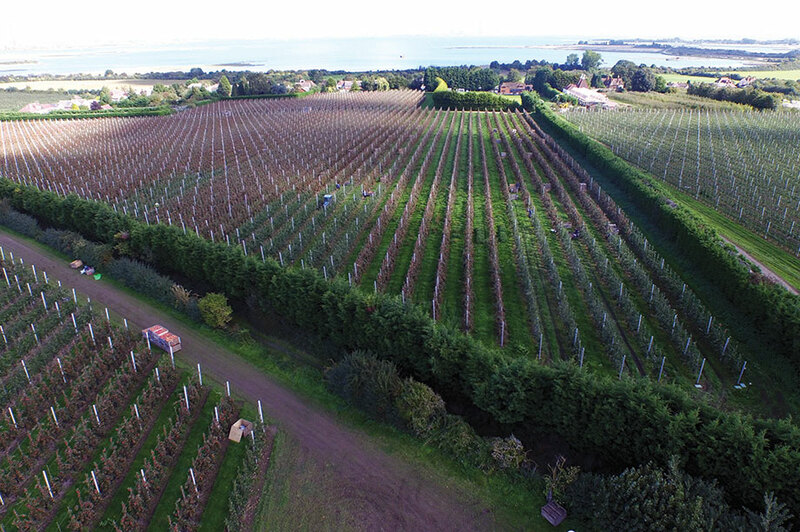 One of the largest schemes has been designed by Tony Freezer of AJ Freezer Water Services to provide water to more than 2,000ha cropped by J&C Farms, Westacre Farms and CE Cross & Son near Swaffham in Norfolk. "It's the largest single project I've ever been involved with," says Freezer. "We have a few larger farm irrigation schemes in the area but they've been built up over the years. It's unusual to have something of this scale installed in one go." The estates and farm businesses formed the Heronhill Water partnership after potato grower Ian Mason approached them to rent land. Heronhill Water handles the considerable investment of the partners and the grant aid they were awarded by the East of England Development Agency. The scheme includes two new reservoirs of 364,000cu m and 455,000cu m capacity and 47km of underground ring mains. These deliver water to 12 Bauer Rainstar E51 irrigation reels purchased by Mason. "It's the culmination of a project that was just an idea two years ago and is now getting closer to reality by the day," says Mason, who typically grows 600ha of potatoes on rented land each year. "We'll grow potatoes on land that hasn't been able to support the crop before, ready to supply outlets just a few kilometres up the road." This year around half of his crop will be planted in fields serviced by the new irrigation scheme, with the main customers being crisp maker Kettle Foods and processor Lamb Weston at Wisbech. A small percentage is also sold to retail packer Manor Fresh. Another example of the new efficiency drive is Briggs Irrigation's purpose-built reservoir pump, which is designed for high volume applications, rather than the higher pressure required for irrigation. Engine speed can also be linked automatically to water levels in the watercourse, enabling the pump to increase extraction rates as the stream or river rises, in accordance with the terms of the licence. "Reservoirs have become an important asset on many farms, especially in the East of England and it makes financial sense to have the right equipment to fill them," says director Adrian Colwill. Javelin Irrigation Systems has introduced the MOP 216 diesel unit to the market. By using a heat exchanger with the pump's suction inlet, the company claims that the pump set has one of the lowest fuel consumption figures in its class. Meanwhile, Greencrop has improved the semi-electronic control and engine protection panel on its range of diesel pumps. "It will retain the familiar gauges that operators will recognise. However, the read-out screen is three times the size, start-up will be a much simpler operation and diagnostic information will be easier to understand and see," says UK sales manager Howard Chantry. "New panel options for 2011 include full GSM of start run data and stop functions and a cubic metre per hour record." Austrian-based Bauer has recently expanded the potential range and use of its pivot and linear systems. A special polyethylene coating has been applied to all components that are exposed to water. The company claims that this will allow use with liquids that otherwise cause corrosion to standard steel pipes, such as sugar or food industry waste water. A newly developed underground control system provides faultless guidance of linear systems, the company says, because it is not being impeded by interference from cables or ditches. The system is also used to precisely control Bauer's recently developed corner systems. This converts a circular irrigation surface into an almost square pattern, ensuring optimal irrigation of the total available area. The corner system can also be retrofitted to existing pivot systems. Greencrop Irrigation in Norfolk is the UK importer of Irrimec hose reel irrigators and offers machines from 110m up to 800m long. The Standard ST range can be supplied with either manual or hydraulic turntable, jack, legs and trolley, while the MDT and MM Master range models are fully hydraulic, will sit down on the ground in working mode and can rotate 360 degs. This lowers the centre of gravity and allows a horizontal pull of the hose at the machine. To extend the ST range, Irrimec has introduced the ST8 110TG650, which has been working well over the past year. The hose reel irrigators are built to last with a drum painted with epoxy anti-corrosive primer and final coat of oven-baked polyurethane paint, while the chassis, turret and gun trolley are hot galvanized. A patented Turbimec turbine drive system is fitted to the machine and is interchangeable for flows from 10-130cu m per hour. "All Irrimec irrigators are driven by a low-power turbine, which will run from a minimum of 3.5 bar mains pressure," says Greencrop's UK sales manager Howard Chantry. "This ensures reels will still work on a long-range system or a main, supplying more than one reel." 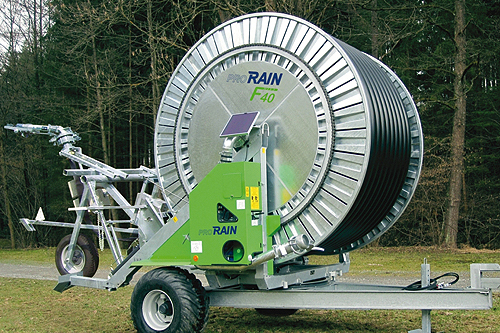 Bauer has also introduced a reel irrigator for growers who do not require the capacity or sophistication of the flagship Rainstar series. "The ProRain is built to the high-quality standards of Bauer, with all the major steel components galvanized to give the machine a long service life," says Bauer UK sales manager Adrian Tindall. "Growers rightly regard purchasing a reel irrigator as a long-term investment and the ProRain will stay the course." Not everyone is dependent on rain-guns and boom systems, however. 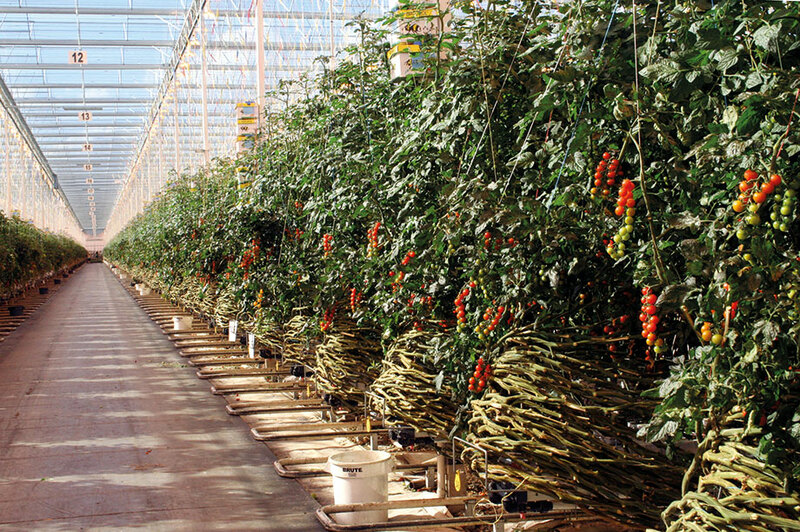 Darran Grieveson, managing director of New Leaf Irrigation, says drip and sprinkler systems now dominate the company's sales in the vegetable sector. "Many growers view them as a backward step. However, new products are designed to be left out in the crop and the uniformity achieved is much higher than with the old metal impact sprinklers that some growers have seen," he says. "Combining new developments with radio control, which gets away from using cables, means you can have tensiometers next to the solenoid valves, controlling the application of water across the field to match crop use."